Agreed: the header 'Special Bikes' seems a bit out of place, on this website with nothing but special bicycles. But, hey, what else should I call it? Anyway, what I would like to present on this page are slightly different bikes'. The designer of this bicycle is Danish born Mikael Pedersen (1855 - 1929) and dates back to 1893! 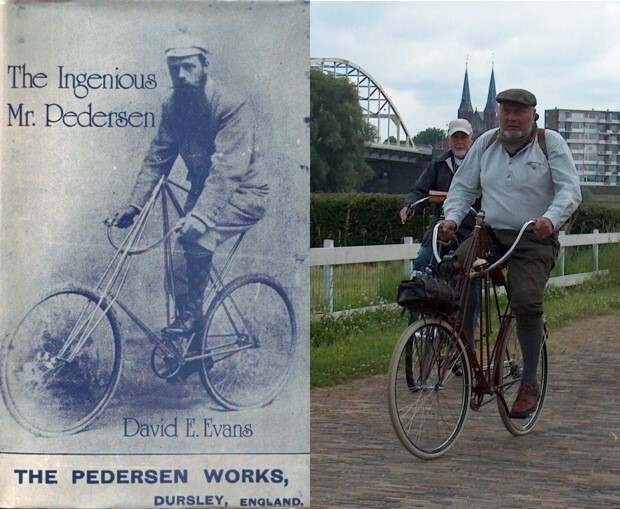 Pedersen made lots of inventions, but we will focus only on the Pedersen bicycle. The most striking thing about the Pedersen, also called the " Dursley-Pedersen " (Pedersen moved to England, where he founded the Dursley-Pedersen Cycle Co) is the very high frame that is build up of none less than 14 thin tubes, welded at over 50 spots, creating 21 triangles! In the late 19th century, bicycles were a relative new product, but they already have had their evolution that ended in the "diamond frame', the same design that is still being used in most 21st century bicycles. Mikael Pedersen was disgusted by the lack of comfort of these safety-bicycles, and started looking for a way to improve it. He 'borrowed' the design of a cantilever bridge and turned it into a bicycle: the Pedersen was born. Apart from the frame, the most striking item is the seat, that looks like a kind of hammock. 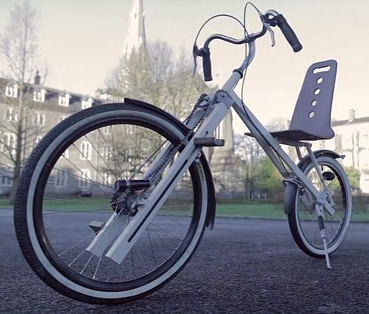 In 1978 another Dane, Jesper Sølling, discovered the original Pedersen and he decided to start (re-)production of this forgotten Danish bicycle. Since then, the Pedersen is being handbuild in small numbers in Copenhagen, Denmark. One of the Van Raam bicycles is the "Tavara". This bicycle has the crankshaft moved forward, somewhat like the American "chopper". Because of the forward placed pedals, it is easy to put both feet on the ground, still sitting in the comfy saddle. A safety feature that most other bikes can't offer. Tavara bikes are made with or without suspension, Prices start around 1000 Euros. SInce we started this website, Van Raam has come up with a successor for the Tavara, called the Van Raam Balance, available with or without electric assistance. 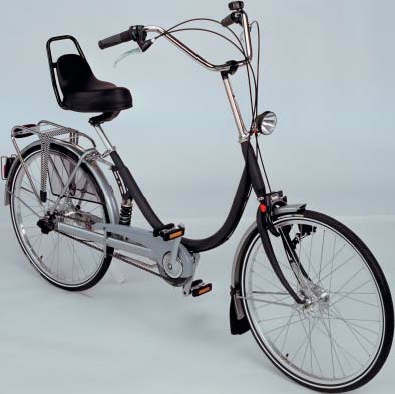 Ideal for cyclists who suffer from bad knees..
Another remarkable bicycle is the Dutch Giant Revive. 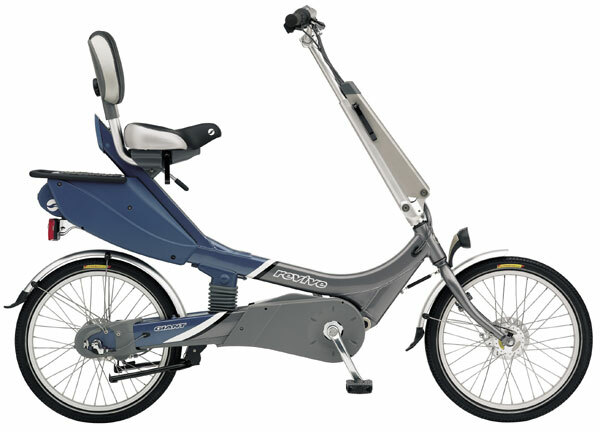 The design of this bike is in between a 'normal' bicycle and a recumbent. 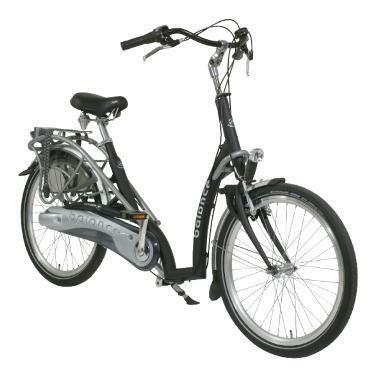 Some rather unique features are included in this bike: integrated chain, an adjustable saddle (no tools required), backrest, 20" wheels, etc... A Pedal Assist version is also available, see picture. Giant made a series of ORANGE coloured Revives, that were given to the Dutch contestants in the 2004 Sydney Olympics. 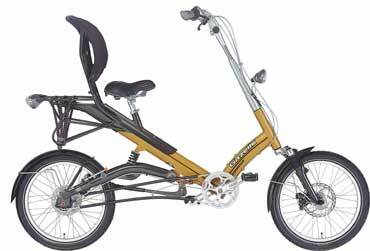 And here's the answer from Gazelle on the Giant Revive: the Gazelle Easy Glider. Equipped with a same kind of saddle, backrest, disc brakes, front and rear suspension, etc..., this bike will set you back about 1000 Euros..
A German named Christoph Lenz revived an old idea into a very original bicycle: instead of having to turn the pedals around a crankshaft, the rider of the MAYNOOTHBIKE has to push the pedals up and down along the front fork.